﻿What is the 4th axis? It is a rotational axis, labeled "U" on this unit. The syringe mount clamps to the cylinder that descends from the robot's head, allowing for 360 degrees of rotation. What is the 5th axis? It is the tilt axis, labeled "V" on this unit. See the close up picture below. 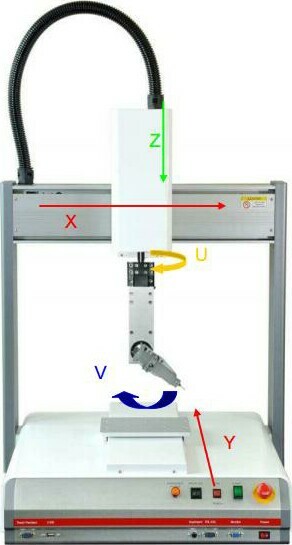 The angle of the syringe can be adjusted mid program, setting the unit apart from the standard 4 axis system. Includes the 5551107N 5 Axis Robot fitted with a spray valve system designed for spraying flux, urethane, paint, lubricants, and coating or marking applications. Includes the teach pendant, IO cable, valve controller and valve mount. Requires regulated compressed air, up to 100psi, to function. 115V or 230V power supply. ​Intended for complex level dispensing. 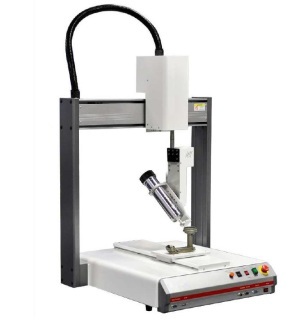 Perfect for any application where the head needs to rotate to stay perpendicular to the part or stay aimed and dispense into the corners rather than alongside the wall of the part.